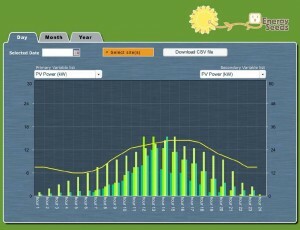 Energy Seeds» Blog Archive » The importance of data monitoring solar school projects? The importance of data monitoring solar school projects? There are two flows connected to every solar school project. The first flow is electricity.Â Sunlight hits your solar panels and this starts a process that ends with electricity flowing into your school. The second flow is data/information.Â An on line meter records the amount of solar electricity flowing into the school.Â This is valuable in a lot of classroom teaching activities because it shows the students what the flow of solar electricity looks like.Â Since it is impossible to see the electricity flowing, the data reveals the profile of that flow.Â It records both the amount of electricity generated and also when that electricity is generated. For example, we all know that almost no electricity will be generated at night when the sun is not shining light on the panels, but the profile will also demonstrate how the generation of electricity is lower at the start of each day and at the end of the day.Â Sunrise and sunset provide less sunlight than the middle of the day or early afternoon.Â We all know these facts, but the data display proves these facts in real time and in the form of a graph. Now another value to having on line data monitoring is that it provides all of us with a way to determine if your system is working properly.Â For example:Â if someone accidentally turns off your solar electricity system there will be zero data in your monitoring profile. It may also be that someone turned off your data monitoring system and maybe your solar electricity part is working perfectly.Â Either way, zero data in your monitoring profile alerts us that one of your flows is not working and we can then figure out what is not working and fix it.Â Without the data monitoring profile, your system could be broken without anyone knowing it.Â Since nothing burns, there is no flame to see.Â Since nothing turns, there is nothing to watch rotating. Â There is no way to know if your system is working without looking at some form of data device. The on line devices we require to be part of every solar school project provide both teaching tools for your classrooms and, at the same time, provide you with a device that acts as an immediate warning that something is wrong with either your electricity flow or your data monitoring. Footnote 1: most data systems allow for an e mail to be sent to one single person if there is any problem with the flow of your data.Â This means you would be notified by Email the instant your data stopped flowing or flowed in a way that is inconsistent with your systemsâ€™ past profile.Â You would not be notified by Email every night when the sun sets warning you that your system was no longer generating electricity because your profile would normally not be producing electricity at night.Â But if your system stops showing electricity generation at 2:00 PM, you would get an immediate Email telling you to check your system.Â If you want to get this type of notification at your school and you are currently not receiving it, Email me at Glen@LearnEnergy.org and I will help you set this up. Footnote 2:Â some data systems have a monthly cost.Â Many data systems have no monthly cost for data monitoring.Â If your school is currently paying a monthly data monitoring fee and you want to see if you have other options, Email me at Glen@LearnEnergy.org and I will help you with this options. This entry was posted on Sunday, January 6th, 2013 at 1:25 pm and is filed under General Info, Solar Schools . You can follow any responses to this entry through the RSS 2.0 feed. You can leave a response, or trackback from your own site.